It was a pleasure interviewing Pat Gallagher, who developed the first automated photovoltaic solar cell tabbing and stringing machine back in 1979. (Before I was even born!) Pat has seen the tabbing industry mature, and he was kind enough to help answer some questions about the process that I’ve grown to love. Jim: What were the initial design goals? How have they evolved over the years with customer’s needs? 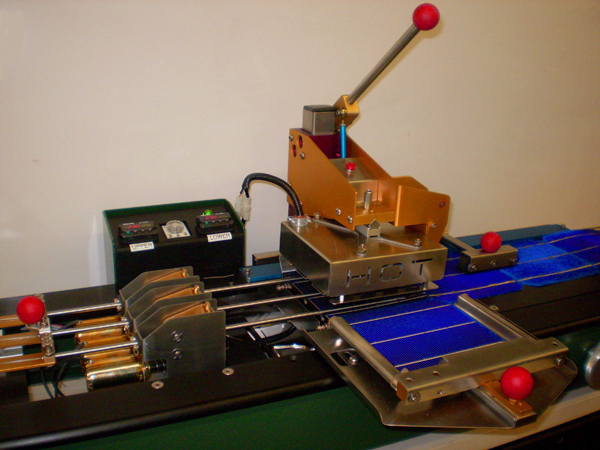 Pat: Our primary goal was to replace variable hand labor in soldering with a machine and a process. That still holds today. Back then, solar cells were very expensive, thick, brittle, and not very efficient. So the biggest issue was to avoid breaking cells. Our first advice to the cell people was to turn the crystal 45 degrees to the bus bars so that the sides of the cell wouldn't break off along the solder joints. That little trick remains in place today. Jim: Were the first machines designed to tab and string separately, or in a combined process? Pat: Our first design was to make strings of cells in one shot. The two-step process, fronts then backs, was a holdover from hand soldering and there was no reason to do that anymore. Surprisingly, however, we ended up accidentally inventing the mechanized tabber on the way to creating a fully automated one-step stringer. Jim: So that’s where the stand-alone tabber came from! I would have guessed it was the other way around. Have there been any changes to the heating method? Pat: Oddly, the first thing we tried was induction heating. It was wonderful except that it took 5,000 watts to bring a small solar cell to temperature. It seemed rather wasteful, but that was the smallest industrial RF system available. Then we tried IR light, which also worked well. That's what we used in the first automated system. Jim: Early tabbing ribbon must have been pretty crude. Have you noted anything that has changed with the copper or solder coating used over the years? Pat: Basically, it's the same flat conductor that we started with in the 70's. The coating chemistry has changed dramatically. Taking cues from the electronics people, we started with lightly tinned copper and that was it. Solder was introduced on the cell so the ribbon did not need a heavy solder coating as is common now. No-Lead (Pb-free) has been challenging mostly because the process window is smaller and simply hotter. The cells can be hurt if heat exposure is too long or too fast. If you’d like to meet Pat (the President of Solar Automation) and learn more, you can email him by clicking here or visit the Solar Automation website.